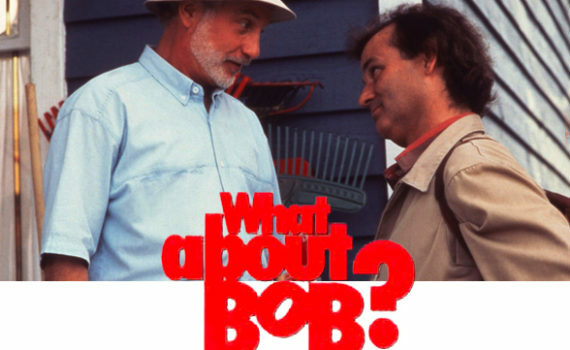 Movie Review – What About Bob? My Top 5 favorite movies are as follows: The Royal Tenenbaums, Braveheart, Ferris Bueller’s Day Off, The Princess Bride, and What About Bob? Now, any Top 5 list is going to be highly influenced by when you made it, how old you were, what emotional ties you have to the items on the list. So can I say these are the five greatest films ever made? No, not in good conscience nor as a professional film critic. But they are my favorites, for various biased reasons. What About Bob? is no exception; a movie that I love through & through and will always find hilarious no matter how many times I watch it. And it may be the movie I’ve watched the most times; equally great every viewing, never getting old, a classic comedy on a tier of its own. The simplest way to put it; Bob Wiley has problems. He’s a veteran psychiatric patient who’s gone through countless shrinks on a mission to fix his issues. He’s multiphobic, freezes up in public, has a hard time leaving his home, and talks to a goldfish. But when he meets Dr. Leo Marvin, Bob thinks he may have found the man who can help him. Trouble is, Dr. Marvin is going on vacation and this scares Bob to the core. Solution; follow Dr. M. to New Hampshire, meet his family, join in on his fun, and basically crawl into his life. And while The Fam thinks that Bob is great, Leo sees that this relationship is spiralling out of control, violating the doctor/patient agreement. But getting rid of Bob is not an easy thing to do, as Leo will soon find out to his utter horror. Never has a comedy been more quotable than What About Bob? Every line is brilliantly written, perfectly timed, and crafted to be both memorable & ridiculously funny. It’s a movie you can watch a million times, reciting the dialogue right along with the actors, remembering every conversation for its humor, wit, and complete frustration. Bill Murray & Richard Dreyfuss are the perfect pair, the odd couple that can’t get along, the rigid doctor and the goofy patient who become so enmeshed in each others’ lives that they can’t separate, no matter how much one of them wants to. Two actors have never played off each other better, creating a balance of well-timed jokes and heart-felt moments. And the story is one you’ll never forget. People dress up as Bob & Leo for Halloween they’re so memorable, spout the lines with ease, and laugh out loud at scenes they’ve seen a hundred times. What About Bob? is at the top of my list as the greatest comedy of all time; a clever, over-the-top, touching story of two men who can’t get along with or without the other, as entertaining a movie as you’ll ever watch.